Uttanasana is also known as "Standing Forward Bend". Uttanasana is the Satnding Yoga Pose. 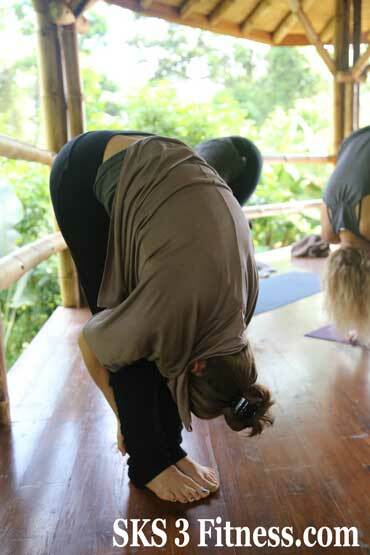 Uttanasana is the combination of 3 Sanskrit words, 'Ut' + 'Tana' + 'Asana'. Where, Ut means 'Intense', Tana means 'Stress', and Asana means 'Pose'. This pose is also known as 'Standing Head to Knees Pose'. Difficulty level - 5 out of 10. - depending on your lower body flexibility. How to do Standing Forward Bend? Stand straight with legs together and hands straight down touch to the side of the thighs, like Tadasans. Take couple of deep breath and calm your mind. While exhaling, slowly bend forward from your Hip-joint, not from the waist. (There is big difference between bending from Waist and Hip-Joint.) Do not bend your knees. Without bending your knees, touch feet or toes. Then try to touch your palm to floor or Yoga mat. If you are regular Yoga practitioner and your body flexibility is moderate level, then grip your back of ankle and slowly-slowly pull until your head touch to the knees. Stay in this pose or Hold this pose for 30 seconds to 1 minute. 10 seconds are enough for beginner. Gently breath from Nostrils. Then slowly come back to the original or starting position. *Bending from Hip-Joint and Waist are different. Waist is above the Hip Bone-Joint. Do not bend your knees, your legs must be straight. Do not try to bend beyond your limit. I already specify instruction for different level of flexibility below at the end of this article. Uttanasana is good for Stomach, Kidney, Liver and Heart functioning. This Yoga pose strengthen back and leg muscles like hips, thighs, calf’s etc. This Yoga pose calms the mind - brain and relieve the stress, depression. Regular practice of Uttanasana yoga pose increase concentration. This Yoga pose relieve stomach pain and improve digestion. This Yoga pose increase the strength and flexibility of the spine. Regular practice of Uttanasana yoga pose improves balance and co-ordination of the body. This Yoga pose reduces menstrual cramps during menstruation. Uttanasana helps to cure infertility, osteoporosis and sinusitis. Those who have knee-joint pain or ankle-joint pain should avoid to do Uttanasana or Standing Forward Bend. Avoid Uttanasana Yoga pose, if you are feeling like qualm or reel. If you have a Low or High Blood Pressure, Headache and Insomnia then avoid Uttanasana. Those who have back pain also should avoid doing Uttanasana Yoga pose. Variation of Uttanasana Yoga pose, totally depend on your Body flexibility (specially lower body). * If you are beginner and doing Uttanasana yoga first time then obviously your hands will not touch to the floor or Yoga mat, so just cross your forearms and hold your elbows. * If your body flexibility is more than Moderate level, then after bending forward from hip-joint touch your palms to the ground or Yoga mat. Once you touch your palm slowly try to place your palms of hand under the soles. This pose or variation is known as 'Padahastasana'. * If your body flexibility is really great then I have really great variation of Uttanasana for those people. Some different steps for them. Stand with shoulder width apart, so there will be lot of distance or gap between legs. Slowly - slowly bend from hip-joint. Try to bring your head beyond your legs. At comfortable level. Do not try to pull beyond your capacity.